The number of caped superheroes appearing on television in the fall recently increased by one. 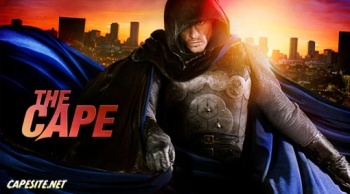 NBC has announced that it's picking up one-hour television show The Cape for the Fall 2010 broadcast season. The Cape is another journey for the network into superhero territory, but the series' main character has more in common with Batman than characters from NBC's now-canceled Heroes. The Cape stars David Lyons as police officer Vince Faraday. Faraday gets caught up in a situation never seen before on television or in movies: He ends up framed for a series of murders. I know, crazy right? Faraday is presumed dead and goes into hiding, but leaves behind his wife and son, giving him a reason to remain connected to the real world in any way he can to keep them safe. That way happens to be to don a hooded cape and superhero suit to battle the criminal element of Palm City. Cleverly enough, because Faraday dons a cape, he decides to call himself "The Cape" after his son's favorite comic book hero. Faraday has no actual superpowers to speak of, and is trained by a band of thieves. Firefly's Summer Glau stars in the show as an investigative blogger also trying to take on crime and corruption in Palm City. She aides The Cape with her blogging expertise. The Cape's nemesis is billionaire Peter Fleming, played by James Frain, who seems to the opposite of Bruce Wayne, moonlighting as a twisted killer named Chess rather than a hero with bat ears. The show sounds pretty cool, let's hope it's done right and worthy of DVR space.